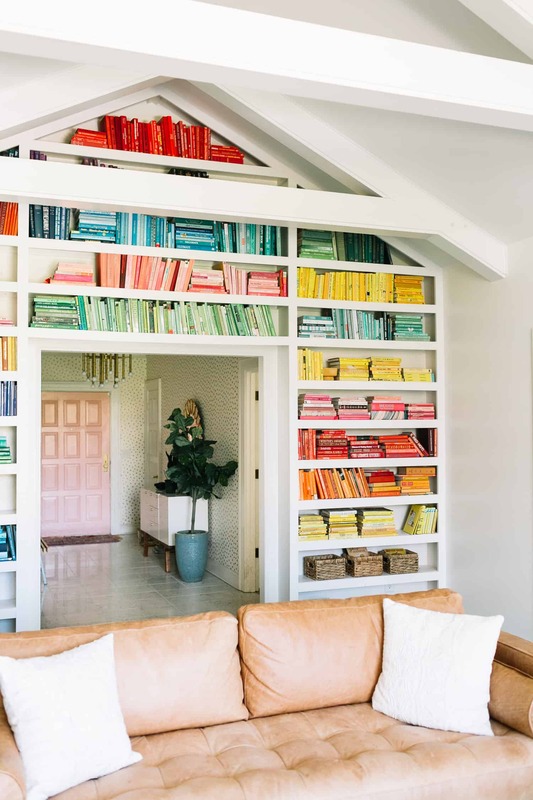 Today, I am so excited to share my completed rainbow bookshelves with you. Collin built the shelves for me a year ago and then I spent the entire year filling them. It was a lot of space to fill and I wanted to be somewhat selective on what types of books I collected (more on that below). I could tell within the first month or two that the rainbow was going to be visually amazing, but it was a lesson in patience for me to collect slowly and live with a half-finished project for over a year. Many people asked (some nice and some not as nice) if we were actually planning to read/use all the books or if I was just collecting based on color. The honest answer is somewhere in between. Let me explain. I focused on topics that were appealing to me, Jeremy and Nova. For Jeremy, I chose a lot of history, politics, music theory and cookbooks from all over the world. For myself, I collect 1970s craft books, different kinds of cookbooks (I tend to love more cocktail and baking books), books on design, renovation, cabins, fashion, dream interpretation, biographies, gems and plants … my list of interests goes on and on. And for Nova, we collected children’s books and stored them lower on the shelves so she can reach them. I purchased almost all the books secondhand. The only books that are new are ones I would have bought anyway (a few design books I purchased last year and a lot of children’s books that were gifts to Nova). We found a local store where we could buy many books for less than a dollar. I went a few times per month all year long and filled a cart with books each visit. Like I have said above, I have no problem with buying some books as decorations, but if I did I feel like buying secondhand makes it even less of a problem. I mean, if the books are being loved and appreciated as a collection, that is better than sitting on a used bookstore shelf, right? Sorry if some of my wording seems a little defensive, I don’t mean it to! I just got a LOT of messages that were like, “Are you even going to read these books” all year long and so I feel like I want to explain myself. Haha—but moving on—I can accept the fact that you either like the idea of a book collection or you don’t. Anyway, I would still stick to the sections of the store that I was more interested in, but keep an eye out for certain colors. That’s the routine I developed that worked for me. I had several vintage loving friends who sent me books with colorful colors they found for bargains. I actually never got to a library sale because the dates just didn’t work for me. I tried all kinds of thrift shops and couldn’t find the best prices. I mainly collect hardcover books (although there are a lot of softcover mixed in too) and a lot of thrift shops charge more than $5 each for them (which adds up fast). I found a local used bookstore that had a big range of prices (there are lots of books over $10 but also books for 25 cents). It’s called McKay’s if you live in Nashville and I LOVE going there. Garage sales and estate sales can also be amazing. I didn’t have as much luck, but maybe you will. My best advice for shopping for used books is to go often—find places you like to go and go a couple times every month or even once a week. You can’t collect a quality book collection in a couple of shopping trips, at least not a large one. I highly recommend shopping slowly and taking your time. It’s worth it! I hope this has been helpful. Collin is planning to make a post about building custom shelves soon, so if you have any questions for him you can leave those in the comments. And, of course, if you have any questions for me about our process or our library wall I am happy to answer them! Credits//Author: Elsie Larson, Project Assistant: Collin DuPree, Photography: Amber Ulmer. Amen to that! I think it’s awesome. Also eBay and Amazon you can get books for crazy cheap sometimes too. Like 1 cent! And sometimes you can combine the shipping if you buy from the same used salesman. I love this so much. So so so much. It would make me so happy to have such a cheerful space in my house. And how fun to have a library to pull books from whenever you wanted. Whether or not you read all these beautiful books, this shelf arrangement inspires pure joy! Thank you for sharing (and sparking curiosity as to how I could install something similar into my own home)! We love how this turned out Elsie! 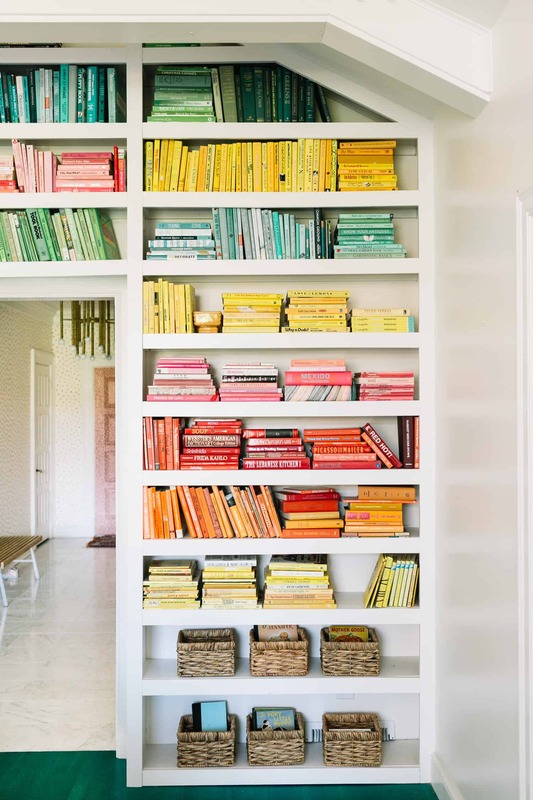 We sell decorative used books by color and can provide this look for adoring fans in their own design spaces! I think its brilliant!!!! Thousands of people have huge libraries in their homes and I can about guarantee that they don’t read every single book either. Who cares what some jerk thinks. People get brave behind an internet comment…big whoop!! These bookshelves are amazing! I need them in my life! I think it looks incredible! I bet it took forever but it definitely paid off. This inspired me so much! We have so many book at our house and all 4 of my kids are always reading something new. I think I’m going to get several variations of wrapping paper and use Modge Podge to make all of our old books prettier and display them in a similar way. this is going to be amazing! Thank you so much for your constant inspiration. Think about how you will find your books with the titles covered! I did this with some of my books and it is beautiful but annoying to find a book I’m looking for. Need to figure out another way where I can write the titles on! 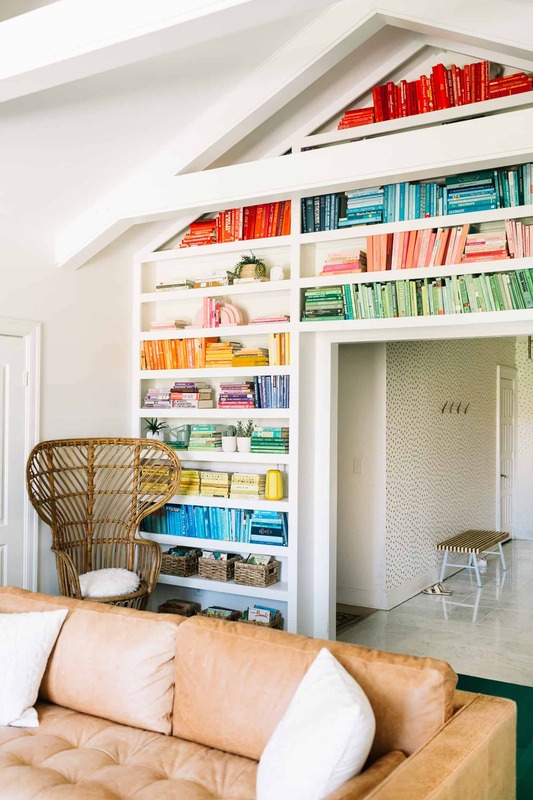 I have a rainbow bookshelf at home too, it’s so cool to see such a large one! Great job! I love this so much! Books are one area of my life where I am a die-hard maximalist and I have no regrets. 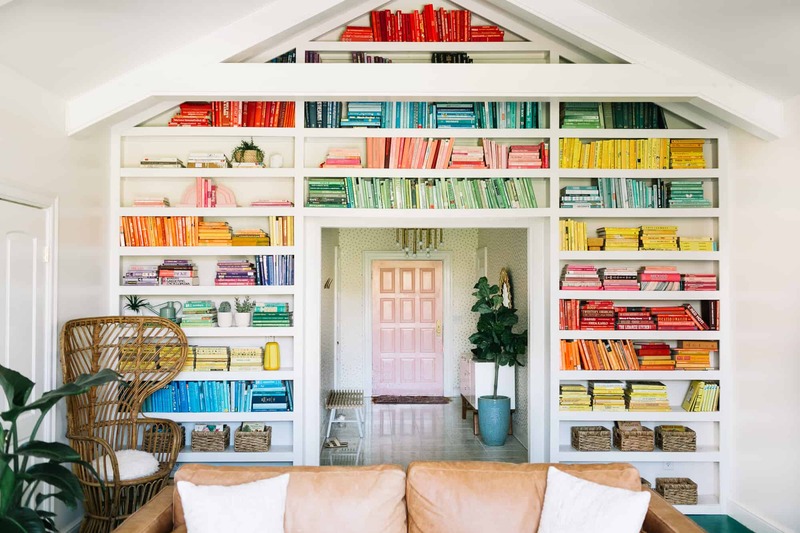 I already have 4 bookshelves in my 1 BR apartment (+ lines of books in book ends on desks, wardrobes, and windowsills) but cannot wait to get a house with built-ins (or build my own) and do something like this. I also organize by color, though my collection has way more black and white than yours since they’re mostly books I’ve read. I figure there’s a way to get those in there too … or maybe I’ll have 2 giant bookshelves in 2 different rooms, a color room and a black and white room … oh, the possibilities are endless! 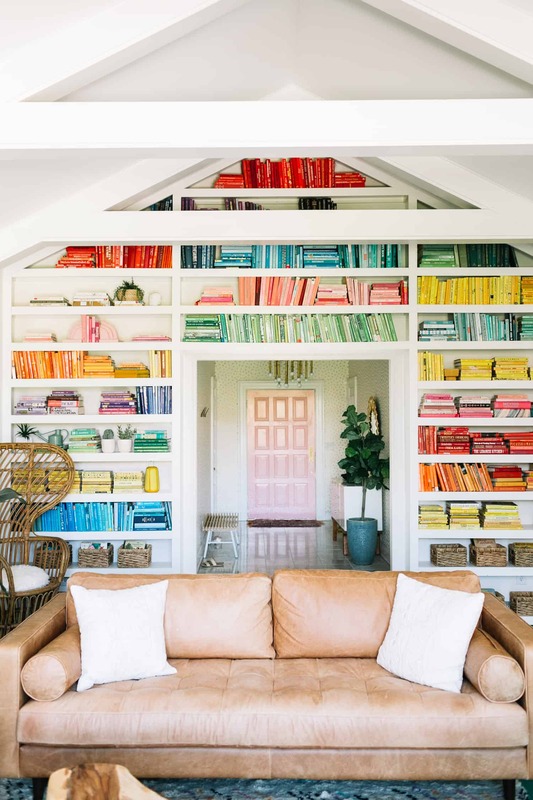 I find rainbow bookshelves very appealing visually and I’ve tried doing it once…….I had to take it apart within a week or so because I just found it very frustrating when my books are not sorted alphabetically by author (OCD? maybe). So I think it’s super pretty and if it works for you that’s really cool too. I don’t know why people would be negative about it. 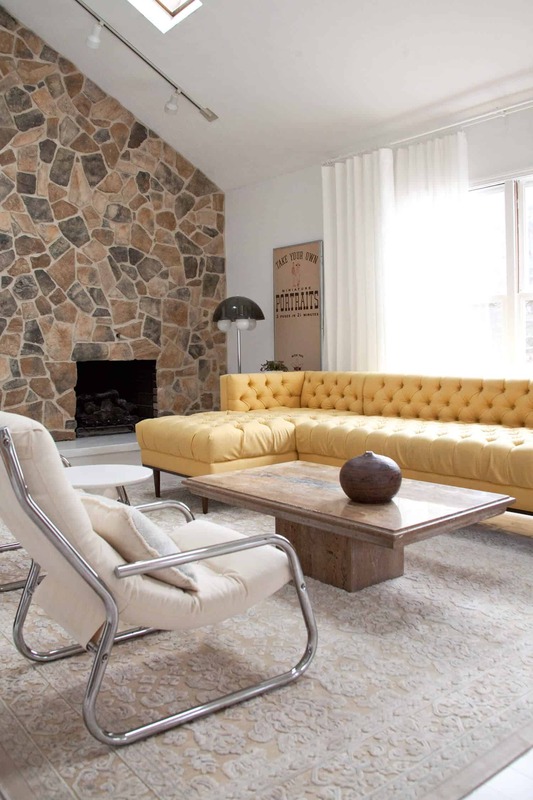 This is your home, your stuff, you organize it the way you want, you collect what you want. I collect books too and intend very much to read all of them but some have been sitting on a shelf for years and I haven’t touched them yet. And my spouse is also a book lover and we’ve both been digging into each other’s bookshelves so some of these books may very well not be read for another decade or so. Who cares, they have a happy home and are loved nonetheless ;p One day, I will have an actual library room in my home filled with books and cosy furniture to lounged and read. And if I can get the kids to love reading as much as I and their dad do, bonus! I’ve heard this a lot- doesn’t bother me though. I think a big part of it is that my books are mainly non-fiction reference books, where author’s names are not as memorable. I love it so much!! I love that you took the time to find lots of books that your family will enjoy, makes it even more special. I have a question—where do you keep books you previously owned or will buy in the future that don’t fit into the color scheme? Do you have another hidden book space in the room? I would love to see more ideas on your blog with solutions for bookshelves because I love having books easily accessible but hate how junky they look. Most of mine aren’t pretty colors. I have been watching you fill these shelves all year and I am surprised that I liked the “progress” pics better than the final product. It is strange, I can’t put my finger on what it is about the end that I don’t love as much as when there was more space. 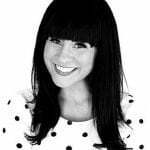 I have a library wall that is not near as organized as yours, and people do ask “wow, have you read all those?” And my answer always is “not yet!” I just like to be surrounded by books, and you have done a beautiful job doing that for your home, so don’t mind the nay-sayers. And thank you for explaining your sources – very helpful! This is so stunning and inspiring! If you ever find yourself in Baltimore, make sure to hit up The Book Thing! It is a free bookstore. It’s huge! And you can literally take any book for free. They have a great selection and there’s no catch. They just want people to take and love the books, and to pass them on when they’re done. I love love love this! I also organize my books by color and I love the idea of collecting books around this idea while also finding books of genuine interest. It’s also amazing for Nova and your future little ones. Who knows what interests they will have and you will be covered no matter what! 🙂 This has inspired me for sure! I personally don’t feel that building a book collection visually is for me, BUT I will say that my parents had a massive book collection when I was growing up (and still do). They didn’t build it up for visual reasons, and instead just bought any book they thought they or we kids would have an interest in, and being a kid who loved reading, I read EVERYTHING I could get my hands on. 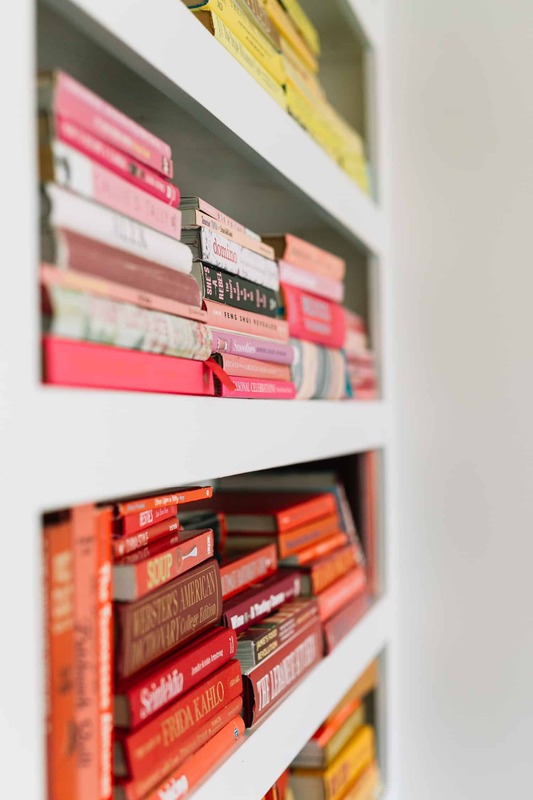 Looking back, I think having such a massive collection of both old and contemporary books encouraged me to read voraciously, and I think the things I read and learned were way more diverse than if my parents had been more intentional in their book buying. I am sure your daughter will enjoy more and more of your library the older she gets. 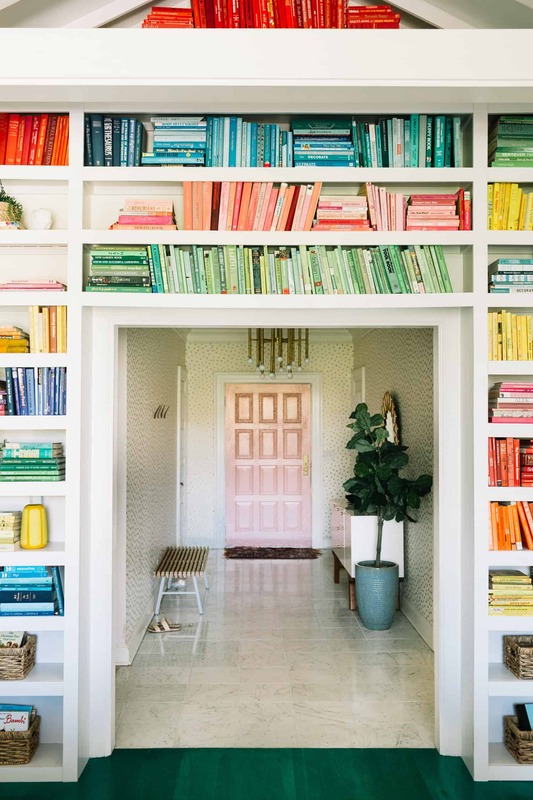 I have so much bookshelf lust right now…Gorgeous! 1) How do you organize your shelves? Clearly you go by spine color, but within each color do you have an organization system? 2) I really enjoy the look of floor-to-ceiling bookshelves but always wonder how to get good access to the top shelves. Did you have any breakthroughs on this, or does it still require finding a ladder to get down a book? Woww.. Your bookshelves look amazing. “If I have bookshelves like this, I will read book everyday”, my son said. Gorgeus room!! Looks great! I arrange my books by topic so I can find them easily, but this looks better. 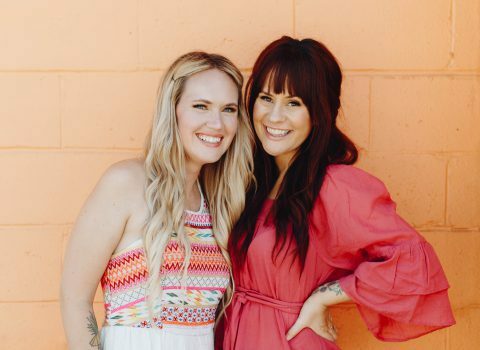 I was soooo inspired when you first shared your rainbow book shelf wall on instagram. I LOVE this project! It turned out so pretty! And I don’t think reads have to be read to be loved a cherished! This is such a cool project! We had a similar experience when collecting colorful glassware for our wedding! We also had a lot of skeptical family that kept asking, “What are you going to do with all this after the wedding!” But it ended up paying off and was a beautiful (affordable, especially compared to renting less beautiful glassware from a company) addition to our wedding day. 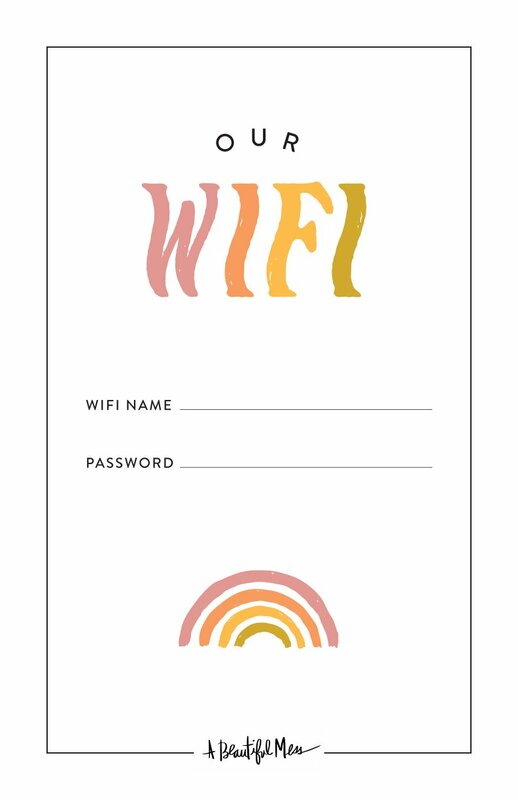 And now we get to pick our favorites as a souvenir from our wedding and pass the rest onto someone with a similar wedding design! Your colorful glass collection in your kitchen was definitely one of the inspirations, so thank you! As someone who works in publishing there are so many great reasons to buy books that go beyond just planning to read them! I also am the kind of person that goes on vacation and comes back with books and fabric. I may or may not read them but getting them from somewhere special made me happy and I always note where I bought them and when in the covers. Your wall is beautiful and I’ve enjoyed watching it come together on your instagram! I hope to have a full wall bookshelf myself one day. I was wondering if the bookstore you were talking about was McKay’s! It’s awesome, right? I haven’t been to one (there is – or at least was – one in Chattanooga too) in quite awhile, but it was super-cool when I was there! Wow. What a lovely bookshelves, Elsie. Seriously, you do not have to justify or explain yourself! Who cares if you don’t read them all?!!! What an absolutely stunning project!!! I absolutely LOVE this! I think it’s all about balance like you say and books are an art form in themselves so they make the perfect item for decoration!